To stop Chiyo from leaving again, Mother has the maids lock the front door gates every night. With the doors locked, Chiyo lies awake for the next few nights wondering how she will escape the okiya to meet Satsu. On the day before Chiyo and Satsu plan to run away, Chiyo washes the wood floors in the maids’ room. While she cleans, the soapy water snakes across the room. The sight of the water flowing makes Chiyo daydream of flowing to the second floor and then to the roof. Chiyo suddenly remembers that she can get onto the roof of the okiya, but she doesn’t know how she’ll escape once she gets up there. Earlier Chiyo said that water find its way through any crack, and here she learns that lesson firsthand by watching the water flow. By meditating on water, Chiyo realizes that she too can find a way to escape the okiya by slipping out through the roof. Water here represents Chiyo’s adaptability and ability to respond to her environment in order to take control over her own life’s path. Like a river, she won’t be dammed – she will try to break past the obstacles. The following evening when everyone goes to sleep, Chiyo sneaks up to the roof. She swings her legs over the side of the slanted roof and hears people talking in the street below. Chiyo tries to gently slide herself down the roof, but she quickly gathers more speed than expected. Unable to stop herself, she slips off the roof and lands in the street outside the okiya. In a daze and with her entire body in pain, Chiyo sees Auntie come out of the okiya. More angry than Chiyo ever has ever seen her before, Auntie pulls Chiyo inside and begins to beat her mercilessly, telling her that she will never be a geisha now. Auntie’s violent response reveals her own dissatisfaction with life. Unhappy that she has been forced into life as a maid, she takes out her frustration on Chiyo when she sees Chiyo going down the same path. Thus, Auntie might be physically beating Chiyo, but she is also expressing her hatred and anger at the horrible circumstances that force young girls to pick between life as a maid and life as a geisha. The next morning a doctor comes and sets Chiyo’s broken arm. In terrible pain, Chiyo goes to Mother’s room. Mother says that she won’t invest any more money in a girl who might just run away. Mother says that Chiyo must now pay back the substantial debts she owes by working as a maid. With her debts so high, Chiyo now must expect to work as a maid for her entire life—an echo of Auntie’s fate. Auntie had broken her hip before the end of her geisha career, and now Chiyo breaks her arm. In the months after Chiyo’s failed escape attempt, everyone in the okiya ignores her, treating her as if she isn’t even there. All that winter, she wonders what happened to Satsu and if her mother and father are still alive. During this time, Chiyo’s only comfort comes from imagining herself returning to Yoroido and running along the path to her house. But something always stirs her from her daydreams, causing her to return to her lonely reality. Chiyo’s failed escape attempt seems to have broken her spirit along with her arm. Chiyo gives up on trying to leave the okiya and instead retreats into her fantasies, as she did as a child. Chiyo seems to have emotionally and psychologically backslid – she is now more like the past child running away from her grief, and less like the resilient girl looking for escape. When spring comes, a package arrives for Chiyo from Mr. Tanaka. Auntie takes the box and opens it, revealing mortuary tablets from her family’s Buddhist shrine. There is also a note from Mr. Tanaka that Auntie reads aloud to Chiyo. The note begins with Mr. Tanaka musing on how the spring’s beautiful “flowers that grow where old ones have withered serve to remind us that death will one day come to us all.” Mr. Tanaka then writes that six weeks after Chiyo left for Kyoto, her mother died, followed soon after by her father. Mr. Tanaka writes that he knows Chiyo will succeed as a geisha and turn her suffering into beauty. At the end of the letter, he briefly mentions that Satsu arrived in Yoroido last winter and immediately ran off with the Sugi boy. Tanaka’s letter shows that he is more misguided than cruel. He appears to care for Chiyo, and may have actually believed that selling her and Satsu into slavery was the right thing to do. Tanaka’s poetic line about the flowers also introduces a key aspect in the theme of Beauty, Artifice, and Truth. As Tanaka recognizes, all beautiful things are reminders of death because they remind us that beauty can never last. While this makes beauty inherently melancholic, Chiyo will adapt this idea in order to find comfort in the notion that, like beauty, suffering too is only passing. As Auntie reads the letter, Chiyo feels the tears streaming down her face. Hearing that both of her parents died, Chiyo feels as if her mind is a broken vase. Pitying Chiyo and her grief, Auntie helps Chiyo place the tablets on a shelf near the base of the stairwell. Auntie tells Chiyo never to forget her parents, because they are all that’s left of her childhood. Auntie’s claim about Chiyo’s childhood suggests that because Chiyo has undergone one of life’s major struggles – the loss of one’s parents – she has now lost the innocence of childhood. Plaue, Ethan. 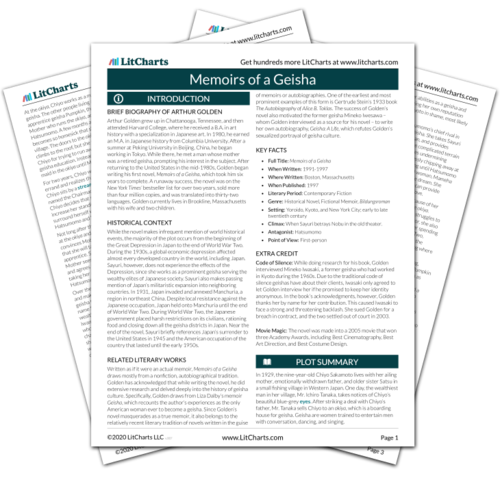 "Memoirs of a Geisha Chapter 8." LitCharts. LitCharts LLC, 4 Nov 2015. Web. 25 Apr 2019. Plaue, Ethan. "Memoirs of a Geisha Chapter 8." LitCharts LLC, November 4, 2015. 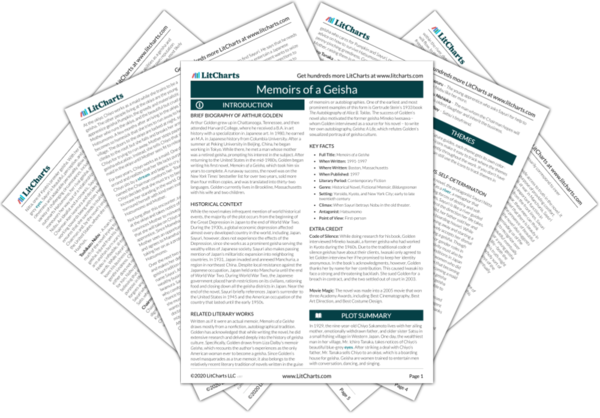 Retrieved April 25, 2019. https://www.litcharts.com/lit/memoirs-of-a-geisha/chapter-8.